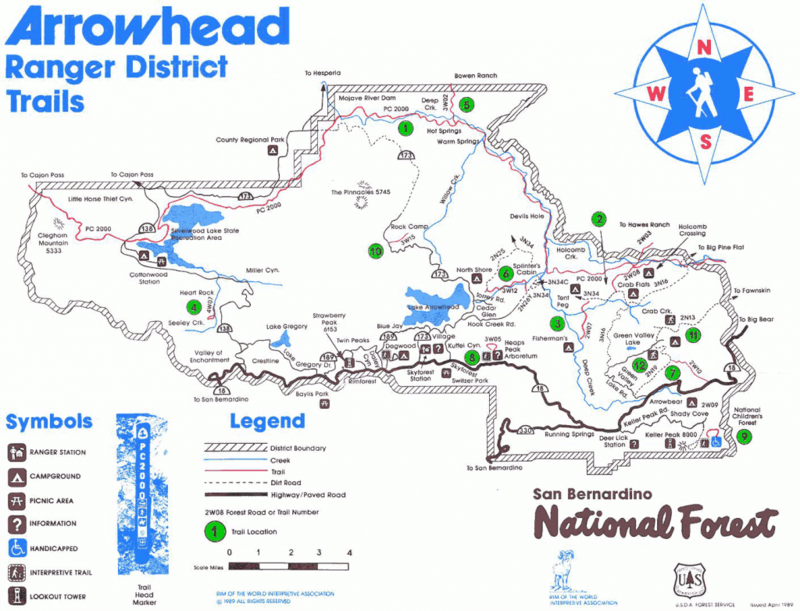 Hiking Guide on the Lake Arrowhead Ranger District Trail System. An Adventure Pass is required to park at most trail heads. They are available in the Chamber Visitor Center, exceptions are noted. This lakeside trail begins from the back of the South Beach Parking area in Lake Gregory Regional Park. From Highway 18, take Lake Gregory Drive to San Moritz Drive. Turn Right on San Moritz and look for the Parking area on your left. This is a great hike for dogs. To reach this short trail turn left on FS Road 2N03 at the entrance to Camp Seeley on Highway 138. Proceed ¼ mile to the trailhead, marked “Heart Rock 4W07”. This easy hike follows Seeley Creek to an overlook called “Heart Rock” which marks the trail’s end. The gentle grade of this trail makes it an excellent walk for all ages. The Adventure Pass is not required at this trailhead. Located on Hook Creek Rd. in Cedar Glen (off Hwy. 173) Drive to end of Hook Creek Rd. The road becomes a forest service dirt road. Stay left when the road forks. Soon you will see an open gate on the right leading to a ½ mile drive to the picnic & restroom area. An Adventure Pass is required to park at the trailhead. Follow the signs to Deep Creek and the Pacific Crest Trail. The Pacific Crest Trail stretches from the Mexican border to the Canadian border so you can choose your own distance on this one. Take Hospital Rd. (off Hwy. 173) When you drive up Hospital Rd. you will see a road on your left & a North Shore Campground sign. Turn at first left and follow the dirt road 1/2 mile to where you reach the trail head on the east (right) side of 2N25. This interpretive trail is located 2 miles east of Sky Forest on Highway 18. The trail is an easy walk for all ages that takes you through a self-guided tour with 25 points of interest about native plants and wildlife. This trail will take you into some of the San Bernardino Mountains’ most beautiful country. This non-motorized trail crossing the 3,400 acre National Children’s Forest is open for use year round & is family-friendly. This paved nature trail begins near the top of Keller peak Road in Running Springs. To get to this trail head take HWY 173 down to the shooting range. When you see the shooting range sign on your left , turn left on the left hand side of the shooting range (on the same side of the street) you should see the trail head post. There is limited parking. The views from this hike can be quite spectacular so bring a camera plus we recommend plenty of water.